Deric's MindBlog: Rhodopsin curing blindness? (click figure to enlarge) Gene therapy rescue of vision in retinal degeneration. 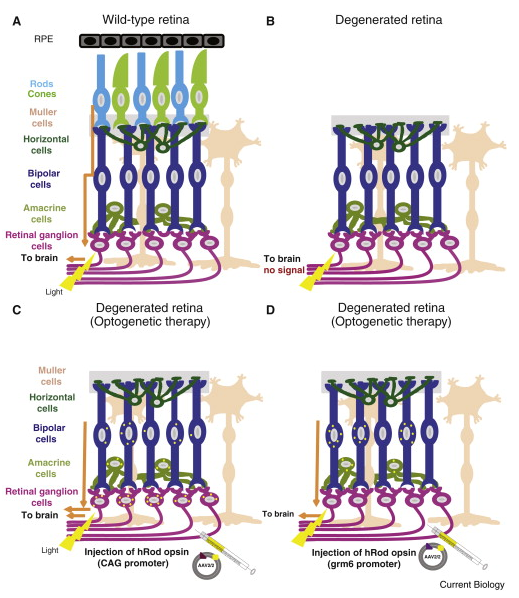 (A) In the healthy retina, light penetrates from inner to outer retina to reach the cones and rods, which transduce signals through horizontal, bipolar, amacrine, and ultimately retinal ganglion cells to the brain. (B) In outer retinal degenerative diseases, loss of photoreceptors renders the retina insensitive to light. (C) Gene therapy with AAV2/2 virus expressing human rhodopsin (hRod) under the control of the CAG promoter results in expression of the photopigment in many surviving cells of the inner retina, and results in restoration of light responses recognized by the brain. (D) More selective expression of rhodopsin in a subset of bipolar cells is achieved by use of a virus in which expression is driven by the grm6 promoter. This version appeared to restore the most natural visual function to blind mice.